Some people really love this shirt. I always thought it was a bit unimaginative. This shirt is somewhat subtle and has a casual look. The name potted plant came from the leaf and stem designs on the fabric. This shirt is reminiscent of a coffee shop in the downtown area of Port Townsend Washington. This coffee shop has huge potted plants suspended about 20 feet up, hanging from the high ceiling, in the corners of the shop near the windows that face the street. These plants grow out of large hanging pots and have foliage touching the floor. 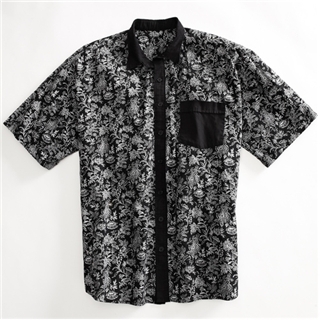 The flower and leaf designs of this shirt’s fabric remind me of those coffee shop hanging plants. This shirt is not likely to go into production.